University of Wisconsin Press, 9780299219000, 207pp. 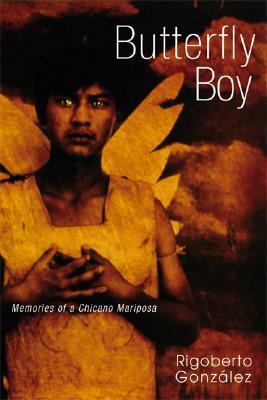 Heartbreaking, poetic, and intensely personal, Butterfly Boy is a unique coming out and coming-of-age story of a first-generation Chicano who trades one life for another, only to discover that history and memory are not exchangeable or forgettable. Growing up among poor migrant Mexican farmworkers, Rigoberto Gonzalez also faces the pressure of coming-of-age as a gay man in a culture that prizes machismo. Losing his mother when he is twelve, Gonzalez must then confront his father's abandonment and an abiding sense of cultural estrangement, both from his adopted home in the United States and from a Mexican birthright. His only sense of connection gets forged in a violent relationship with an older man. By finding his calling as a writer, and by revisiting the relationship with his father during a trip to Mexico, Gonzalez finally claims his identity at the intersection of race, class, and sexuality. The result is a leap of faith that every reader who ever felt like an outsider will immediately recognize. Rigoberto Gonzalez is the author of So Often the Pitcher Goes to Water until It Breaks, a selection of the National Poetry Series, and of Other Fugitives and Other Strangers. A recipient of Guggenheim and NEA Fellowships and of several international artist residencies, he has also written two children's picture books, a literary biography, and an award-winning novel, Crossing Vines. He is on the Advisory Circle of Con Tinta--a coalition of Chicano/Latino activist writers. He works and lives in New York City.